This section displays three of the major devices for animation in movable books. The first is the "jalousie," or blind, effect in which two images, each composed on a separate full sheet, are cut so that the shifting movement of the tab slides one image past the other. As the first image gives way to the second, both images become indistinguishable at the mid-point of transformation. An easy way of animating a page, the flat slats require very little mechanical expertise. The use of tabs is more complicated, since it often involves an elaborate system of elbow joints and other movable parts. Tabs are designed to create multiple actions on the page through a single device. The simplest device of all is that of a folded sheet which opens to reveal a change in part of the picture. 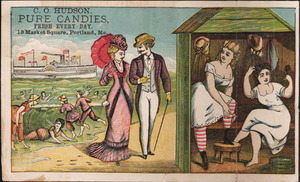 Trade cards, used for advertisements in the nineteenth and early twentieth centuries, specialized in this effect. Their products promised dramatic changes, reinforced by "before and after" pictures. Flat slats, tabs, and folded cards manipulate the page in two-dimensions without creating any illusion of form or depth. The operator must activate these animations, unlike the more "automatic" pop-ups. Hart, Hank. 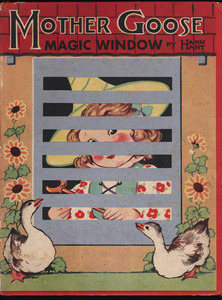 Mother Goose Magic Window. New York: Animated Book Company, 1943. As these images glide past one another and transform, there is an almost Freudian sense of revelation, as if the one image represses the other. As is true of many of these movable books, flat slats provide the children's version of the Freudian idea of the uncanny and the hidden face behind the mask. Bo-Peep becomes her sheep, but the two remain lost to each other. 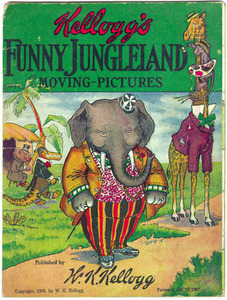 Kellogg's Funny Jungleland Moving-Pictures. N.p. : W. K. Kellogg, 1909. This promotional piece by the Kellogg's cereal company, reminiscent of the harlequinade, exploits every opportunity to call attention to the company's product. Animals of all kinds and in various costumes sing, dance, and play in celebration of "the flakes as light as bubbles." Sagendorf, Bud. 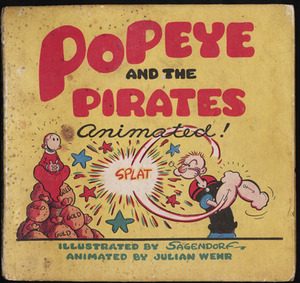 Popeye and the Pirates. Animator Julian Wehr. New York: Duenewald, 1945. Illustrator Bud Sagendorf's images are animated by Julian Wehr to allow multiple actions by the movement of a single tab. 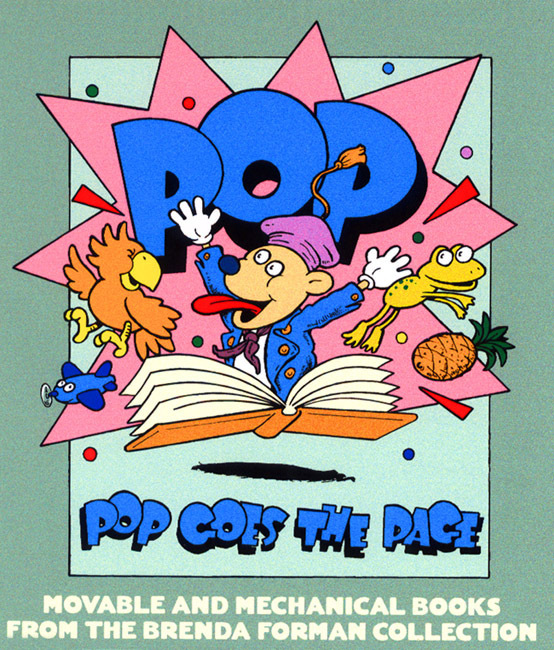 Wehr had a considerable career as a paper animator, sometimes using his own illustrations. As the action gets underway, a dynamic Popeye brings the crowd along on the "Spinacher," sailing in search of treasure. Wehr, Julian, illus. and animator. 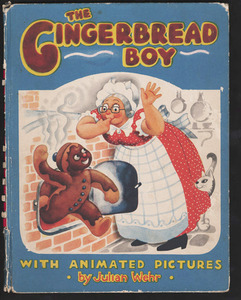 The Gingerbread Boy. New York: Duenewald, 1943. Here Julian Wehr serves as both artist and engineer, creating humorous, if unsophisticated, effects. Wehr produced a number of titles with these less expensive tabs which could compete with well-established full-scale pop-ups in a tight publication market. Assorted Trade Cards. Nineteenth century. Courtesy of Cal Otto. Using folds, these cards maximize the humorous effects of a single simple revelation. Suddenly we discover "How the Conqueror Clothes Wringer Made Jones a Happy Man." Once Mrs. Jones no longer has to exhaust herself on wash day, "the melancholy state/ of Jones, with dinner always late" turns to domestic bliss. 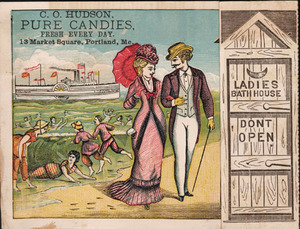 Another kind of happiness is promised by C. O. Hudson Pure Candies when the operator is told to be sure not to open and peek into the ladies' bath house.